Haniel brings you the energy to be gentle and compassionate with yourself and others. He is head of the Principalities, governs the sign of Capricorn and rules Planet Venus. Venus is the planet of love and Haniel will help you not only love yourself and others but also give you the courage to freely express that love without fear of persecution or rejection. You are a child of God and as such you are perfect just as you are. Haniel reminds you that you are learning and growing all the time and as such need to have compassion for yourself. As you have compassion for yourself then so you develop love and compassion for others. As you have love and compassion for others then so you have love and compassion for yourself. Haniel will enable you to see the beauty of God within yourself so you may reflect it to others. Haniel and Chamuel are closely linked. 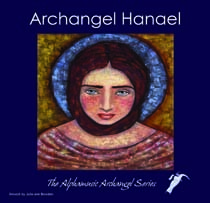 Whereas Chamuel helps you connect to unconditional love, Haniel will help you express it freely.